So, it’s been awhile. I didn’t plan on taking such a long break from the blog, but somehow it just happened. Forgive me? First was the end of Ramadan, which just meant a feverish preparation for Eid. And then was Eid itself and all the family hijinks and parties. And then I was sick with a stomach flu, which then resulted in a cold that JUST WON’T GO AWAY. I won’t bore you with the gory details, but just know that it wasn’t pretty. So back to this recipe; by the time the end of Ramadan rolled around, I’d lost my energy to make yummy things and was just recycling old but gold recipes like these mini cinnamon rolls. That’s why when my aunt came over to sleep over at my grandma’s house (who happens to live in our basement), I was excited to make something yummy with her, since during my childhood, she was the fun aunt. She was the aunt whose house my brothers and cousins escaped to when we were sick of eating Pakistani food every night and wanted something different and fun. She’s the one who used to kidnap us from our mundane weekends and take us to the drive-in theatre, cozying us up with blankets and popcorn as we watched movie after movie. The only reason why this is all in the past is because we’ve all grown up now, and are all so busy with our own lives. But when she came over for an extended stay, I was excited to recreate the childhood magic of making something yummy, especially more so because I could help her make it now! Fry up 4 cloves of garlic and 4 tsp of butter until golden brown. Add cream and bring it to a boil. Add salt and pepper, to taste, as well as the chopped up parsley, leaving some for garnishing. Add all of the Parmesan cheese and whisk the mixture as it comes to a boil. Leave on medium to low heat, keep whisking until it reaches the desired consistency. This can take up to half an hour. Boil a large pot of water. Read the package of the pasta to find out how many cups of water. Once boiling, add fresh pasta and cook thoroughly, following the cooking time on the package. While pasta is boiling, fry up the remaining garlic and butter, and then add the clean shrimp, turning them over once to ensure even cooking. These should be done within a few minutes. In a large casserole dish, start by doling out a bit of the sauce and then layer with the pasta, more sauce, the rest of the pasta and then with the rest of the sauce on top. 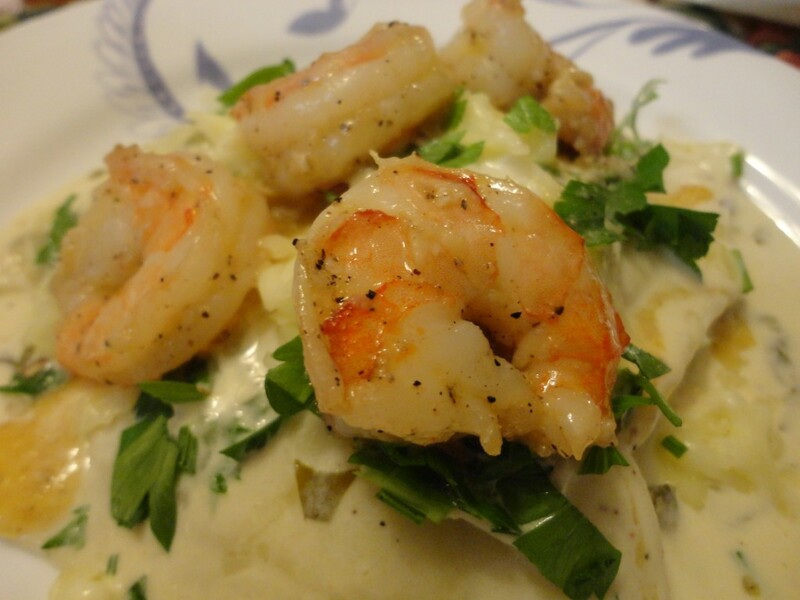 Top with hot garlic shrimp, mozarella cheese, and garnish with remaining parsley. I’ve tried to make an alfredo sauce a few times now, and I have to say, this one is by far my favourite! 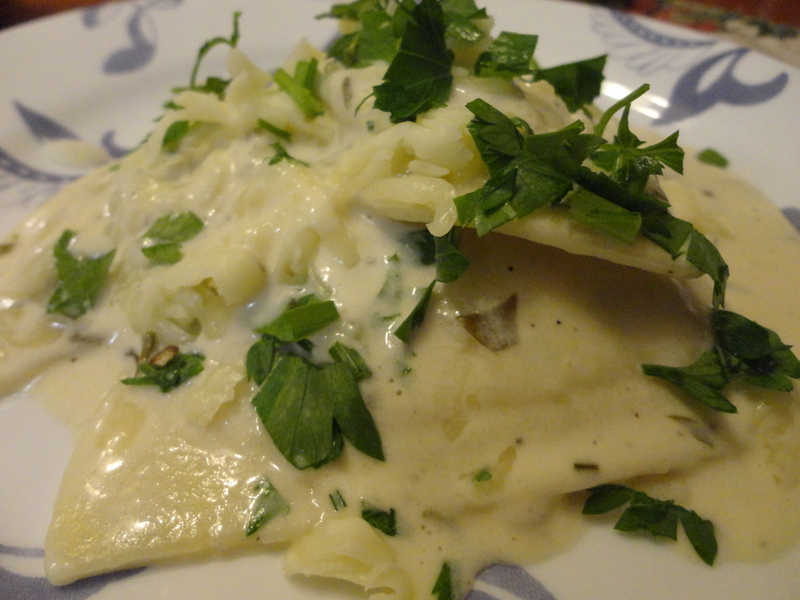 I can’t say anything for the authenticity, since I’m no Italian chef, but it was very creamy and buttery, which is what I love in an alfredo sauce, so it was perfect for me. 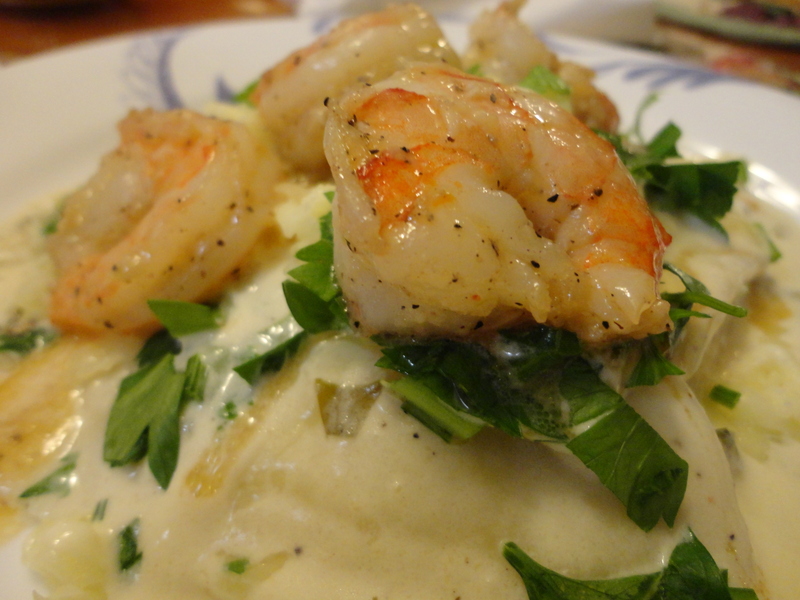 I’ve also never worked with fresh pasta before (which aunt was very disappointed in), but after experiencing the explosion of creamy cheese and spinach, buttery goodness and succulent shrimp, I can’t say I’m going to go back to regular pasta again! Of course, given how I can’t seem to function without a little spice in my food, I added a little extra salt and pepper, so feel free to adapt the recipe to your tastes! 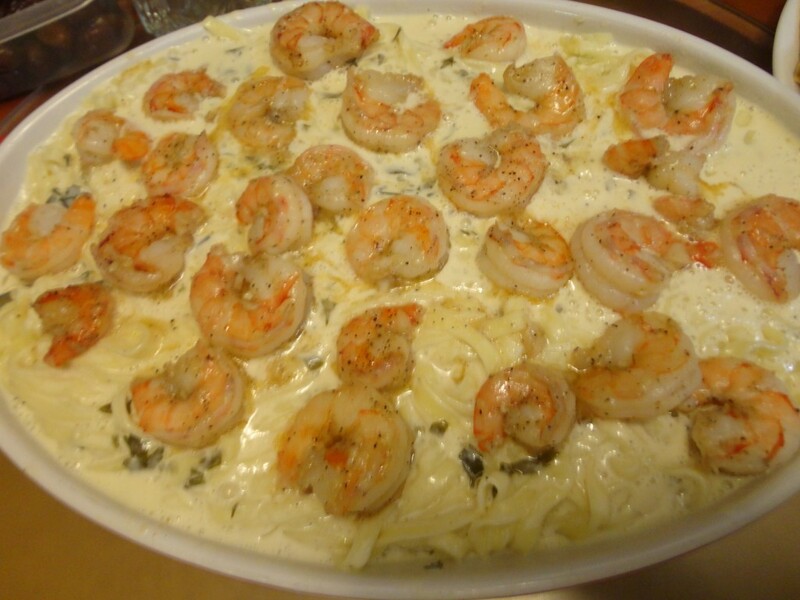 This entry was posted in Recipes, Savoury and tagged pasta, recipes, savoury, shrimp. I’ve never been a shrimp person but this sounds like something that my boyfriend would LOVE to eat! Maybe I’ll just make it for him and pile all the shrimps from my plate onto his haha! Woops, I should have mentioned, you can change the shrimp up for regular grilled chicken or even just eat it vegetarian style since the sauce is SO YUMMY! Let me know if you try it!